Eastern tiger salamanders (Ambystoma tigrinum) are large, often brightly colored members of the family Ambystomatidae. Tiger salamanders can be easy to care for in captivity, provided that they are provided with a terrarium that mimics their natural habitat. Eastern tiger salamanders have a number of close relatives, like the California tiger salamander (Ambystoma californiense) and the barred tiger salamander (Ambystoma mavortium mavortium), that can be cared for in the same way. Tiger salamanders begin life as fully aquatic larvae. Most will metamorphosize into adults after about ten weeks, but some individuals or populations can take longer. For a variety of poorly understood reasons, some individuals of the tiger salamander complex are neotenic; they retain their larval characteristics, and won't metamorphosize. Some related species, like the Axolotyl (Ambystoma axolotyl) are usually neotenic and only metamorphosize occasionally. There isn't anything that the amateur salamander keeper can do if a salamander doesn't metamorphosize, though some labs are able to force metamophsosis by administering iodine to the amphibians. Because of this, some keepers elect to maintain a group of tiger salamanders in an attempt to have all of the life cycle stages represented in the enclosure. This should be done with care though, as adult tiger salamanders don't swim well, and may drown. Tiger salamanders can be housed in a variety of cage styles, but aquariums or plastic storage boxes are the best options for most keepers. Habitats should be at least 18 inches long, 12 inches deep and 12 inches tall, or approximately the size of a ten-gallon aquarium. Larger aquariums should be used if possible, particularly if more than one salamander is included in the cage. If you intend to keep larva and adults in a habitat with a large water area, an aquarium of at least 55 gallons is recommended. Many different substrates can be used for tiger salamanders. Organic potting soil or fill dirt is the best choice, though coco husk and commercial amphibian substrates can work as well. Compress the soil slightly, but don't pack it down too hard. It should be stable enough that you can dig a small burrow with your finger. The soil must be slightly damp for tiger salamanders, but never wet. In practice, the best way to accomplish this is to water one side of the terrarium, thus providing the salamander with a moisture gradient. Tiger salamanders spend most of their adult lives underground in tunnels that they construct, or abandoned tunnels made by other creatures. When above ground movements are necessary, the salamanders do so in low-light conditions. These conditions must be replicated in the terrarium for long-term success, even though they will limit your viewing opportunities. Before introducing the salamander to the habitat, use a few small sections of PVC pipe or appropriately sized bamboo sections, to roughly simulate rodent burrows. The pipes should be stuck in the ground at an angle, and they should be buried so that the opening is flush with the substrate. Wild tiger salamander larvae are carnivores and scavengers. They should be fed a varied diet including insects, worms and crustaceans four or five times per week. Larvae are sometimes cannibals and will consume surprisingly big cagemates, so ensure that they are well fed. Adults are carnivorous, and prefer items like worms, slugs and insects. Adults can be fed two to three times per week, but feedings can be reduced during the winter. Never leave excess crickets in the cage for prolonged periods of time, as hungry crickets can damage the skin and eyes of your salamander. 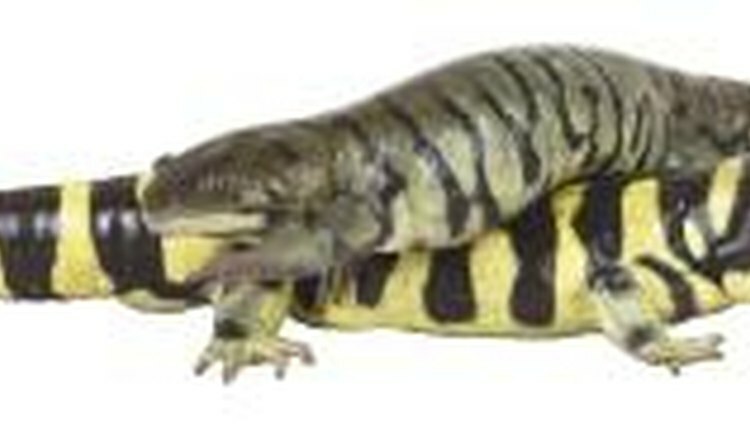 Tiger salamanders are usually nocturnal, though larval tiger salamanders may become diurnal if conditions are too cool at night. "Full Spectrum" lighting is not needed, and may even be harmful; the best choice is to simply use ambient light for the cage. Temperatures should be kept between 65 and 75 degrees Fahrenheit, which is often close enough to room temperature that supplemental heating isn't required. If you do find it necessary to apply supplemental heat, a heating pad placed under a small portion of the enclosure is the best option. Always be sure to check temperatures with a reliable thermometer, rather than guess at the temperature. Tap water contains chlorine and other chemicals that are harmful to most amphibians, including tiger salamanders. In light of this, use rain-water, purified bottled water, dechlorinator to treat any tap water used in the habitat. Distilled water is not appropriate, as the minerals have been removed which can upset the osmotic balance of the salamander. Realize that adult tiger salamanders do not drink water, instead they absorb it from the environment through their skin. If you are only keeping adult tiger salamanders, a water dish is unnecessary. Tiger salamanders are voracious predators, and so they produce a lot of waste. The damp conditions necessary for their comfort will encourage rapid bacterial growth if the habitat is neglected. Spot clean the enclosure daily, and clean the enclosure and furniture weekly with lots of warm tap water and a scrub brush. Rinse the enclosure with treated tap water before returning the salamander to the cage. Some keepers disinfect their habitats regularly, though this is likely not necessary. If you do choose to use a disinfectant, follow all of the instructions on the label, and rinse away all remnants of the disinfectant.